That’s pretty much it. Three sizes: small, medium, and large. Though artful, it’s also breakable as all piggy banks should be. A wonderful sculpture in itself with a cross mark for a coin slot, the Flying Piggy Bank is the work of Galerie Briggite. Not sure if it’s a person or a design studio. Nice though. Real nice. If you’re wondering how come it’s got a cross hair on the back, it’s for accepting currency in different shapes and sizes. Bills too. At a time when humanity’s future is rather uncertain, with food crises and water shortages looming ahead, it’s a wise move to store away a little dough. 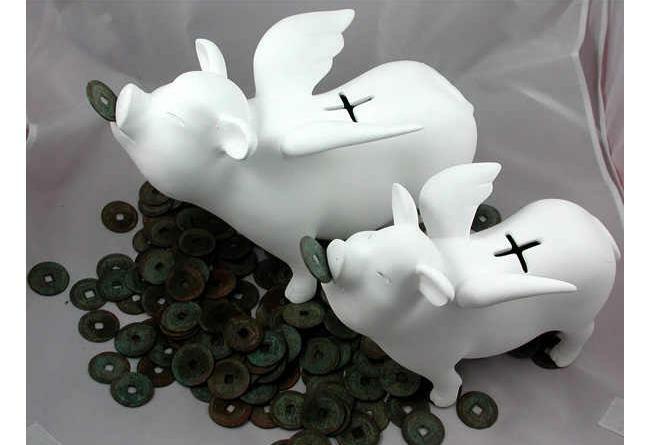 Thus, the Flying Piggy Bank is ideal for people who believe in hoarding their cash. Banks can no longer be trusted, you know. Economies are also especially fragile in this day and age. So it would be sort of wise to amass wealth in a piggy bank (disclaimer: any financial advise in this blog is purely coincidental). Considering it’s also pleasant to look a and sculptural in its aesthetics, the Flying Piggy Bank would make a nice gift. Better than a box of Old Spice.